We are proud to be family owned and run. Since 1985, Nigel, Martyn and their father, Alan Parker, have grown PSH Environmental Ltd (previously Parkers Skip Hire), to become the enterprise it is today. The brothers have an engineering background, beginning their careers repairing lorries. Alan worked as a driver in the waste industry from the 1960s, bringing a lot of experience from this role. Alongside their father, Nigel and Martyn began their skip hire business by fabricating their own skips – most of which are still being used within the business today. If you pay close attention to your hire skip, you may even spot the manufacture date on it. To get the best from each of the waste management processes carried out at their site in Rackheath, the brothers and their team have adapted their own bespoke machinery and their innovation has enabled them to stay at the top of their industry. Every process within our waste transfer centre has been expertly crafted to ensure it runs smoothly and that virtually no waste is sent to landfill. As a result, we are trusted aggregates suppliers and sell recycled products from our location in Norfolk and to screen our soil and fines down to 8mm, with an LOI level of 3-4%. Of course, from humble beginnings hiring skips locally, we have grown rapidly. In conjunction with Seneca Environmental Solutions, we are one of the three household waste treatment and disposal plants used by Norfolk County Council to receive household waste directly from kerbside collections. We also work closely with large waste management companies to receive and divert virtually all waste from landfill. Above all, as a family run business we take pride in our industry and this carries through to every job we carry out. Offering Skip Hire Across Norfolk. 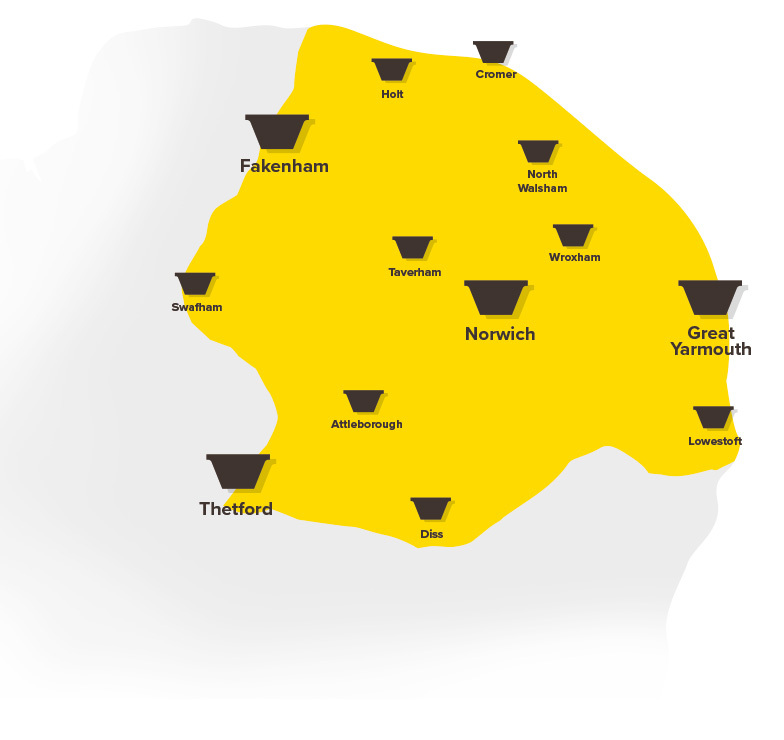 We deliver skips for domestic use along with commercial skips across most of Norfolk. If you are not sure if we will deliver a skip to your home or business, please call us today or complete our quick enquiry form to check with our friendly team.